Gainesville, FL and Fremont, NH – August 11, 2015 – The Funkie Junkie Boutique, one of the industry’s leading online craft supply stores, today announced that it has signed a definitive agreement to acquire eclectic Paperie, an ecommerce site selling supplies geared towards the mixed media market. The agreement further strengthens The Funkie Junkie’s market leadership position, and leverages additional resources in order to meet the needs of their expanded customer base. “Kim has done a wonderful job of building a solid and successful operation that provides superior customer service and the industry’s most popular products to its audience,” said Linda Coughlin, owner of The Funkie Junkie Boutique. “With our common approach to business and product offerings, the acquisition of eclectic Paperie is the logical next step for the ongoing growth of The Funkie Junkie,” added Coughlin. Based in New Hampshire, eclectic Paperie was one of the premier online stores to offer art supplies to the paper crafting industry. The store quickly became a well-known fixture in the paper arts community, with an outstanding reputation for carrying the industry’s top-selling products and partnering with top designers. Launched in 2007, the store has been owned and operated by Kim Schofield since 2012. “Linda’s commitment to providing consumers with a personalized shopping experience, combined with her attention to detail and stellar customer service makes this a perfect fit for our client base,” said Kim Schofield, owner of eclectic Paperie. “I’m confident that our customers will continue to receive the same high quality service and products that they have come to expect,” added Schofield. Under the terms of the agreement, The Funkie Junkie Boutique will purchase the entire eclectic Paperie customer database plus access to the store’s Facebook page and blog. eclectic Paperie will continue to temporarily operate under that name until all assets have been transferred to The Funkie Junkie Boutique or liquidated. The Funkie Junkie Boutique, a sole proprietorship owned by Linda Coughlin located in Gainesville, Florida, U. S. A. 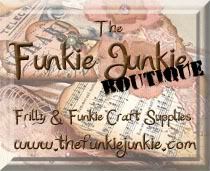 The Funkie Junkie is a boutique craft seller catering to the papercrafting and mixed media craft community, and offers name brand craft supplies such as Ranger/Tim Holtz, Wendy Vecchi, Graphic 45 and many other name brands at a discounted price. The store also offers many fun, funkie, and out-of-the-ordinary findings, which are unique to the market. eclectic Paperie is a different breed of craft store, conceived as more than just a place where you can purchase supplies, it’s a place to collaborate, to come together and share with like-minded crafters. The store’s goal is to offer a mixed media marketplace where a generation of artists can congregate, explore, imagine, and inspire one another. 1. How long will eclectic Paperie’s online store remain open? a. eclectic Paperie will be working to liquidate all assets not being purchased by The Funkie Junkie. The expected close date is no later than September 30, 2015. Upon closing, the eclectic Paperie domain name will be transferred to The Funkie Junkie. 2. What if I have a pending order with eclectic Paperie? a. All pending orders will be fulfilled by eclectic Paperie before the closing date of September 30, 2015. 3. What if I ordered a pre-order product that isn’t scheduled to arrive until after the acquisition announcement? a. Any pre-orders, specifically for Graphic 45, Ken Oliver Color Burst, or Tim Holtz Ground Espresso Distress bundle will be fulfilled by eclectic Paperie before the closing date of September 30, 2015. 4. I place special orders for the new Distress colors each month. Can I still do this with The Funkie Junkie? a. All special order requests will be forwarded to The Funkie Junkie, who also offers a Distress Bundle for a 20% discount each month. You may now purchase your bundle with The Funkie Junkie. 5. How do I subscribe to The Funkie Junkie Boutique’s newsletter service? 6. Will The Funkie Junkie Boutique offer the same products as eclectic Paperie? a. The Funkie Junkie already offers very similar products and will continue to do so in the future. Additional product requests or inquiries may be sent to linda@thefunkiejunkie.com. 7. How do I get in touch with the owners of either store?